Growing hydroponically is a cultivation method that is bound to fail without the right knowledge and preparation. 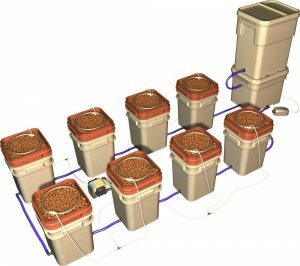 Which is why in today’s post we’ll look at the different hydroponic grow systems that you can use and give examples of some amazing complete hydroponic grow system kits which you can essentially just ‘plug and play’. For your plants to grow they need nutrients, water and light. In nature, these nutrients are provided by the soil in which the plant is rooted. It might as well get them through a different source like…water. Hydroponic growing is the cultivation of plants in nutrient-enriched and oxygenated water, usually mechanically supported by an inert medium like pebbles, rockwool or coco coir. Cultivating your plants in this way does bring some challenges with it…and if you’re a beginning grower, you have to realize starting with soil probably is a better idea. Because growing a hydroponic system is less forgiving for beginning growers. …can mess up your crop in a very short period of time. Soil is also quite a bit cheaper to start with…although hydroponic growing can earn its high initial captial cost back over time through increased yields and an increase in harvest cycles. Hydroponic growing is an extremely rewarding way to grow your plants…and you’ll probably fall in love with it once you’ve got the basics down. 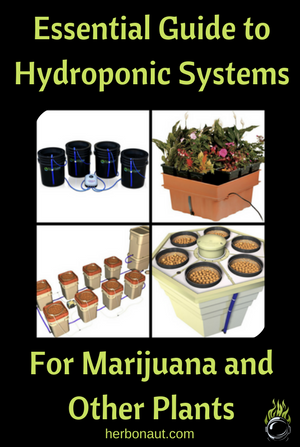 There are different types of hydroponic growing systems all with their own pros and cons. It’s important you really understand the differences well, so you can make the right choice for your space, specific setup and personal requirements (do you have the time to be on top of your grow project daily, or do you only have time to check up on your project every few days for example). This is the cheapest, yet simplest to set-up hydroponic system for a beginner to grow on a small scale. The roots of your plants hang in the nutrient-rich and oxygenated water for 24/7. Your plants having access to nutrient-rich and oxygenated water for 24/7 obviously means your plants are going to grow extremely quick. They’ll grow faster than in most other hydroponic system because it’s a continues flow system. A continues flow system means that the roots of your plants are constantly exposed to nutrients, which sets the stage for a powerful growth curve. Getting bigger plants is also easier because of this growth acceleration. The main downside of DWC is temperature regulation. But in a DWC system this is ESPECIALLY important, since your plants are exposed to the nutrient solution 24/7…and this can be a problem if you’re living in a warmer climate. The water must be changed periodically to provide fresh nutrients and water for your plants and you need to do this manually. To prevent malnutrition of your plants, it’s also important to check pH value of the water often…and if you really want to put all the odds in your favor, to check the nutrient strength/profile with a PPM meter…and more importantly adjust the pH and/or nutrient strength profile when things are out of balance. But even with these downsides, DWC probably is the best hydroponic system to start with if you’re a beginner and you’re just going to grow 2-6 plants. Great, I want to grow with a DWC system…where to start? In a system like this you don't have to check each individual bucket for pH or ppm values, because there's a single control bucket from which the nutrient solution flows. And this will definitely save you some time. Each bucket can hold a single plant. So get as many buckets as the number of plants you're going to grow. 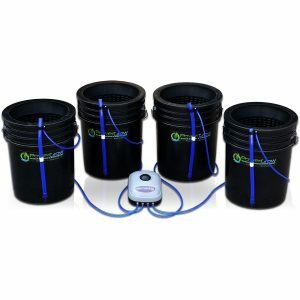 Ebb and Flow is another GREAT hydroponic system for beginners. It’s easier to maintain and a bit more forgiving than a DWC system in case you mess up the temperature, pH or nutrient profile. The downside is that it’s a bit more expensive to start with and if you’re into ‘Do It Yourself’ (DIY), it’s a bit harder to setup than a simple DWC system. Your plants are sitting in a pot, supported by an inert medium like rockwool or pebbles. There’s a nutrient reservoir from which nutrient-rich water gets pumped to your plants roots and then back into the nutrient reservoir, at set interval periods. This means an Ebb and Flow system is not a continues flow system like DWC where your plants are submerged in the nutrient-rich and oxygenated water 24/7. Your plants only get exposed to the nutrient-rich water during the ‘flow’ period, which is a few times a day. The rest of the time they’re left to ‘air out’…and this is exactly what makes Ebb and Flow a much more forgiving system than DWC. Even if the temperature, pH or strength of your nutrient solution is too high/out of balance, a few of these ‘out of balance’ flows to the roots of your plants won’t completely destroy your crop. If you interfere on time and restore the temperature or balance of your nutrient solution, your grow will be fine. Great, I want to grow with an Ebb and Flow system…where to start? 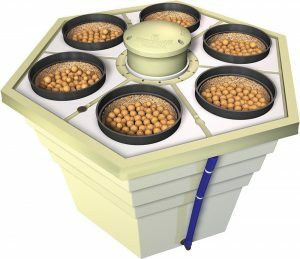 If you’re a complete beginner to hydroponics, the sophistication of this system makes its setup and maintenance less simple than the previous systems. But more on that later. Nutrient-rich water gets pumped from the nutrient reservoir to the top of your growing medium. A drip irrigation system is a continues flow system, which means it’s easier to get your plants growing FAST. But if you’re a beginner, you really need to understand the things that can go wrong in a system like this…and prepare carefully. For starters, if you're into DIY, setting up a drip irrigation system takes more time and care to setup than the previous systems (Ebb and Flow or DWC). Then there’s the danger of emitters clogging up and potentially ruining your grow…if you don’t keep your water and/or emitters free of nutrient build-up. You also need to find the perfect balance on how much you expose the roots of your plants to the drip/flow. Dripping too much can easily lead to root rot or fungus…while too little can result in stunted growth. Lastly, if your power goes off for whatever reason and your pump stops dripping, you basically have only a few hours to notice or else…you're screwed. OK, so why would I want to go for a drip system then…? But this benefit only really starts showing when you grow on a larger scale. 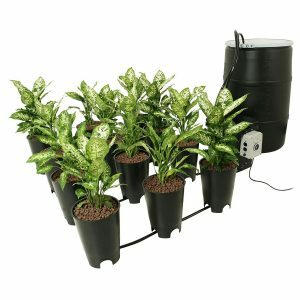 If you want to grow on a larger scale (10+ plants), and efficiency is important to you…by all means go for a drip system. I wouldn’t recommend setting up a drip irrigation system yourself (DIY) if you’re new to hydroponics. Skip aeroponics and choose one of the earlier ones. If you have some practical experience, let’s continue. Aeroponic systems are the most sophisticated hydroponic systems. If you get everything right, it’s also the system with will give the largest rewards in terms of yields and is the most efficient in terms of water- and nutrient-use. It has to potential to outgrow and out-yield any other hydroponic system. Aeroponic systems are the most expensive hydroponic systems, they’re harder to maintain and unforgiving in case of mistakes. Just like with the drip irrigation system, with an aeroponic system, it’s extremely important that you keep the sprayers from clogging up. A few hours of blocked sprayers can completely kill your crop. 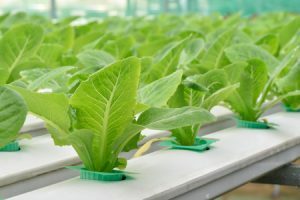 How to keep an aeroponic system clean? Just keep EVERYTHING through which your nutrient solution passes clean: filters, tubes, pumps, etc. 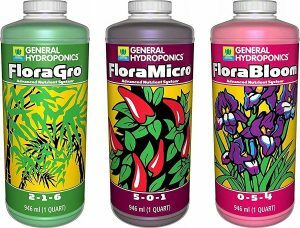 PLUS get some high quality nutrients like those from General Hydroponics. Low quality nutrients can leave a lot of undissolved salt residue behind, which is bad news for your sprayers. If you don’t keep your temperature and humidity levels in check, you risk things as root rot, algae and stunting the growth of your plants in general. As you can see an aeroponic system is one of the harder hydroponic systems to maintain properly, you really need to be on top of your grow and constantly check your system. It’s the most rewarding hydroponic system there is. It’s also the highest yielding system with the quickest harvest cycles. There are just so many things that can go wrong with building one yourself. But hey, if you like a challenge…go for it. First of all, always keep a close eye on the growth of your plants. Specifically check whether there’s any slowdown in their growth or whether they look like they’re suffering in any way. Then check for diseases like root rot and/or pests. But always start with the growing environment. Because that’s usually the cause. Secondly, if you're serious about growing hydroponically, I would really recommend investing in a quality PPM + pH meter so you can actually objectively check your growing environment. High quality PPM + pH meters can get pricey, but they'll last you a long time, are easy to use (calibrate) and extremely reliable in measuring values. 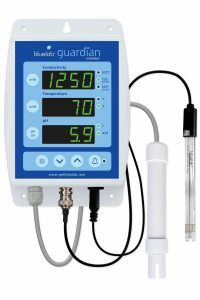 The Bluelab Guardian Monitor will last you a LONG time and is easy to calibrate…which means you'll have an easier time keeping your plants happy and increase yields.